Usain Bolt completed a fourth global championship sprint double in five years when he won the 200m in the Luzhniki Stadium on Saturday night to add to his doubles in Beijing 2008, Berlin 2009 and London 2012. At 19.66, this was the slowest of his title-winning times. On its own, it would slot him in as the eighth-fastest performer of all-time, but it is a mark of Bolt’s achievements that he has made such a performance seem a little bit mundane. From his first win in Beijing, breaking Michael Johnson’s fabled Atlanta 1996 World record of 19.32 with 19.30, Bolt has won in Berlin in another World record of 19.19, in Daegu in 19.40, in London with 19.32 and now here again in Moscow. Taking in his silver medal behind Tyson Gay in Osaka in 2007, Bolt has now won six medals at 200m in six years – five gold, one silver. Others had pushed into the limelight in the preliminary rounds. 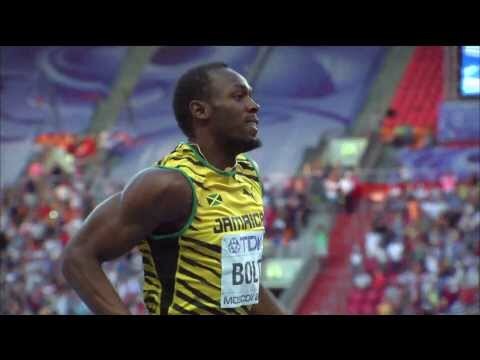 Bolt was not fastest in the heats on Friday morning, nor in the semi-finals on Friday night. World University Games double champion Anaso Jobodwana and 2012 World junior champion Adam Gemili had shared fastest time of the heats, and then Curtis Mitchell ran the fastest semi while 19-year-old Gemili ran under 20 seconds for the first time. In addition, Bolt’s team-mate Warren Weir, the bronze medallist in London, was the second-fastest man in the field here and was talking up his chances of challenging. Bolt, though, is the master of doing things right when it matters most (with the exception of the small matter of his false start in the Daegu 100m final). He knew he could improve in the final here, his rivals knew it, too. He knew his rivals would have to improve to challenge, much less beat him; they knew that, too. 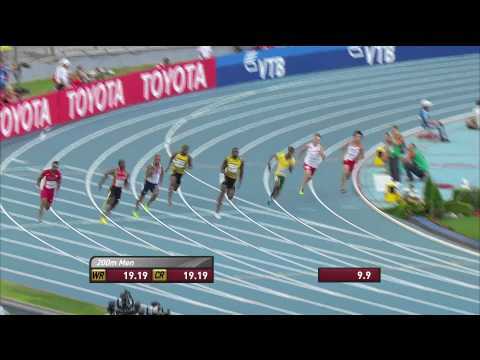 That Daegu false start is the only one of Bolt’s career, and he was rock steady in the blocks here. 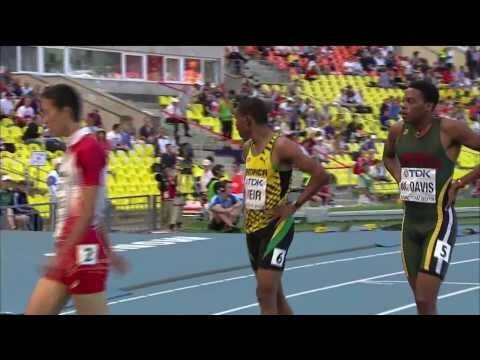 Starting in lane four, he had Gemili, Nickel Ashmeade, Jobodwana and Weir to his outside. He had the slowest reaction time of the eight finalists, but not by enough to be significant. By the turn into the straight, there could only be one winner – barring catastrophe. 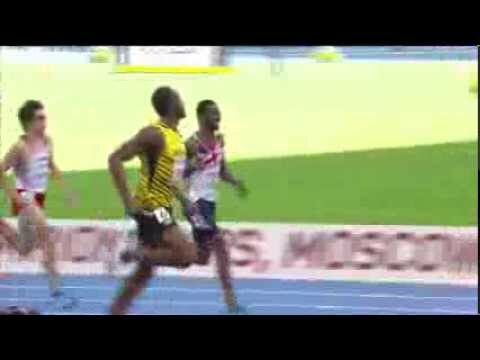 Bolt straightened in the lead and drew away to win by more than a metre. Weir, in the outside lane, was running as fast as Bolt most of the way down the straight, but he could not gain any of the ground he had lost in the first 100m. He took the silver medal in 19.79, equalling the personal best he had set in winning the Jamaican national title in June. Mitchell, Ashmeade and Gemili raced across the line virtually together, with the US sprinter taking the bronze in 20.04, Ashmeade a hundredth behind him and Gemili running the second-best time of his life in taking fifth in 20.08. Jobodwana was not far behind in 20.14, 0.01 outside his best, with only Churandy Martina and Jaysuma Saidy Ndure out of the finish. To recap, then, Weir in second place ran up to his best, Mitchell in third was just 0.07 slower than his personal best in the semi, but had a medal for consolation, Gemili in fifth ran 0.22 faster than his personal best when he arrived in Moscow and Jobodwana in sixth was a hundredth of a second outside his PB. And Bolt ran the slowest time of his two Olympic and three World Championships wins at 200m – but they still couldn’t catch him. 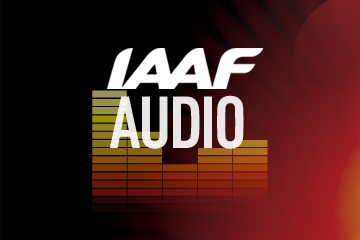 Can this keep going through Beijing 2015 all the way to Rio 2016? Why not: in any case, as with Mo Farah, enjoy it while it’s here.